Actually their dispute seems to be that the list of 417 closings includes 26 Starbucks that closed in and around the Twin Cities after the statewide ban was enacted. Well to set the record straight, many of the Starbucks in MN went smoke-free voluntarily before the statewide smoking ban. Logically then, much of their success was that they (and a couple other non-smoking establishments) had cornered the small smoke-free niche market, but once every other establishment was forced to ban smoking.....Starbuck's no longer had the corner on that smoke-free business. Sec. 13. DISLOCATED WORKER PROGRAM; ALLOCATION OF FUNDS. The Job Skills Partnership Board must enable the dislocated worker program under Minnesota Statutes, section 116L.17, to provide services under that program to employees of bars, restaurants, and lawful gambling organizations who become unemployed from October 1, 2007, to October 1, 2009, due to the provisions of this act. Additional note, "studies" that showed "no financial impact" from smoking bans have repeatedly been discredited, such as this recent university "study"
See which MN lawmakers voted to eliminate choice and jobs (vote link) here in MN. So you can see why Clearing the Air strongly opposes the ignorant anti-business, anti-jobs policies of the Democrat party.....vote Republican this election.....your job may depend upon it. 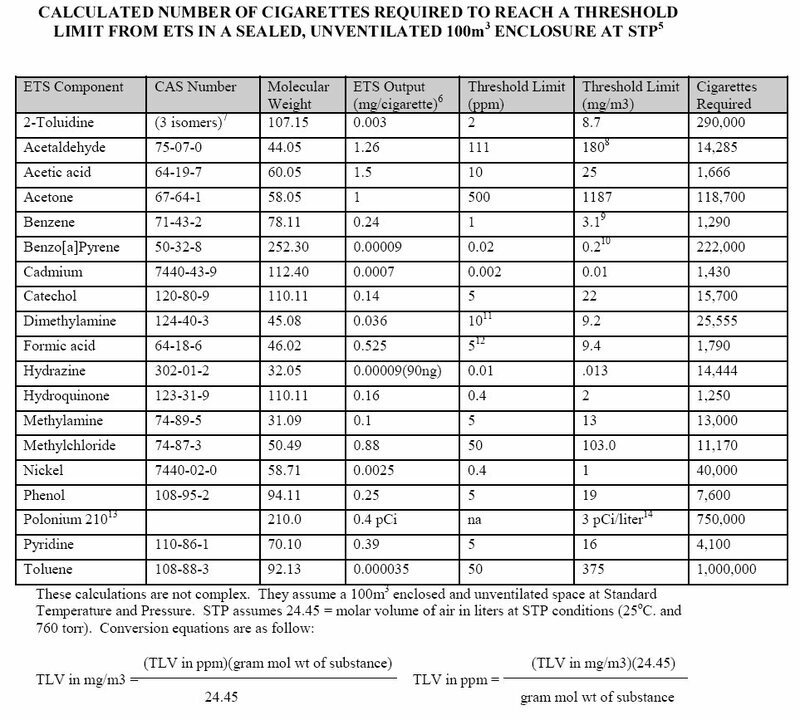 "Field studies of environmental tobacco smoke indicate that under normal conditions, the components in tobacco smoke are diluted below existing Permissible Exposure Levels (PELS.) as referenced in the Air Contaminant Standard (29 CFR 1910.1000)...It would be very rare to find a workplace with so much smoking that any individual PEL would be exceeded." This British Medical Journal published study tested European smoking establishments and found that secondhand smoke levels in ALL of the bars & restaurants tested ranged from 4 to 5,000 times SAFER than OSHA workplace air quality standards require. How does secondhand smoke in the workplace compare to welding smoke in the workplace? Welding smoke is far more hazardous than secondhand smoke. Yet air quality testing shows that welding smoke is regulated to safety standards by OSHA, so lawmakers allow OSHA do do its job rather than ban it. Secondhand smoke on the other hand, though proven to be 15 – 25,000 times SAFER than OSHA workplace air quality regulations, requires government intervention according to Nicoderm funded activists and some lawmakers…….This double standard however, and the air quality testing above prove that a special interest agenda might be the real motive behind the demand for bans. Otherwise, if health were the real concern we would show some consistency, either by allowing workplace (OSHA) air quality regulations in our bars and restaurants.......or by imposing a ban on all other potential workplace air quality hazards. Smoking cigarettes can be hazardous to the smoker, no argument there. However, secondhand smoke is not the deadly hazard pro-smoking ban groups claim. Which should lead one to question what is the real agenda, and why the hype? The Cayuga Indian Nation today won another court victory in its bid to continue selling tax-free cigarettes at its LakeSide Trading stores in Union Springs and Seneca Falls. Anyone who follows the smoking ban / anti-tobacco issue knows the real impetus to increase tobacco taxes and ban tobacco use comes from special interest activists who receive funding from the pharmaceutical nicotine industry. Robert Wood Johnson Foundation's (RWJF) true motive for funding laws which discourage tobacco use comes from the fact that they are part of the Johnson & Johnson conglomerate which owns, sells or manufactures Nicoderm, Nicorette, Nicotrol, Commit, etc.....not exactly an unbiased and upstanding motive.